Abandoned Mall Escape 8bGames info about the game-Games2Rule. Imagine that you went out for shopping. You saw a shopping mall and entered inside. You were shocked by seeing all shops closed. Later you realized that the mall is been abandoned after recent earthquake. When you try to return back; unfortunately the main entrance wall has fallen down and so entrance were blocked. 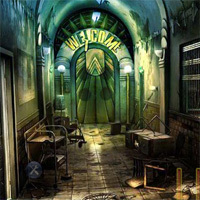 Find some hidden object to solve some interesting clues to escape from the abandoned Mall. Good luck…Have fun!